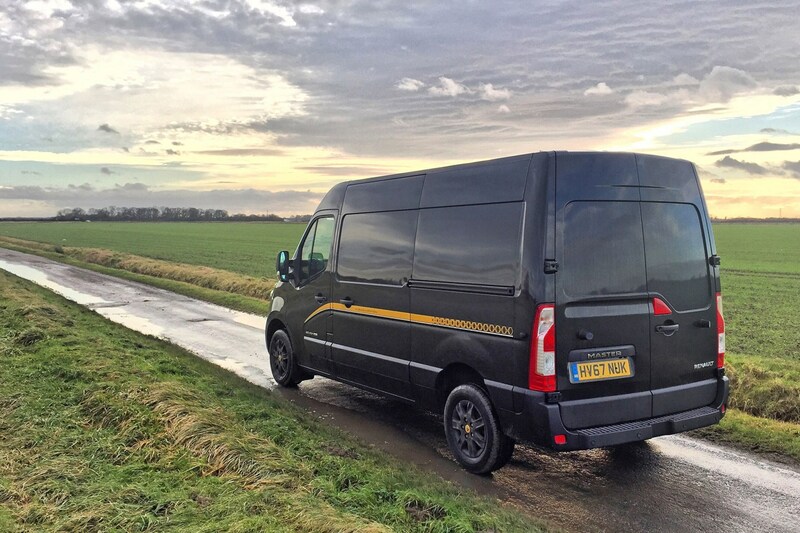 The Renault Master is a massively versatile large van. Available in a huge range of variants direct from the factory – including a considerable number of specialist conversions – the Master certainly gives you choice. Even the panel van range comes in four body lengths and three body heights, and with the choice of front- or rear-wheel drive. It offers highly competitive levels of space and payload, as well as a selection of powerful turbodiesel engines, all of which were upgraded to comply with the latest Euro 6 emissions regulations in 2016. There’s an all-electric Renault Master ZE on the way in 2018 as well. The cab is spacious, comfortable and apparently built from tough materials. Only the slightly bumpy ride may let it down on longer journeys – though this settles down a great deal once you’ve got some weight in the back. You get plenty of standard equipment for your money, too. Supported by the dedicated Renault Pro+ light commercial vehicle (LCV) dealer network, and created by a firm with over 100 years of van-building experience, the Master does a good job of straddling the line between performance and value. Its closest rivals are perhaps the Citroen Relay / Peugeot Boxer / Fiat Ducato trio – though most buyers are likely to find the 2014-onwards Ford Transit near the top of their shopping list as well. Having been launched way back in 2010, the Master is starting to feel its age, particularly versus the newest large vans such as the VW Crafter, while the Mercedes Sprinter retains a more premium edge. The Vauxhall Movano and Nissan NV400 are both alternative versions of the Master, and built by Renault for their respective brands. With high payload capability, strong engines and a practical cab, the Renault Master has lots to recommend it – and you’re almost certain to be able to find a version in the pricelist to suit your needs. Newer rivals do offer a better driving experience, but you’ll also find the very best of these costs more than the Master as well. Value and practicality are seldom as sweetly combined in the large van sector as they are here. Standout features for the Renault Master driving experience are the impressive engines and tight turning circle. Ride comfort could be better, but as a big commercial vehicle it still covers long distances in plenty of comfort. Every version of this generation of Master has been powered by a 2.3-litre dCi turbodiesel engine, right from launch in 2010. A good, tough, motor with plenty of muscle in every guise, it has nonetheless gotten better over time. The main fuel-saving measure for the Energy models is standard-fit stop-start technology. In 2016, the Master’s engines got upgraded again, this time to meet Euro 6 emissions regulations – which involved the addition of a selective catalytic reduction (SCR) system to reduce harmful NOx emissions. This is in line with every other large van (except the Fiat Ducato), and means there’s now an AdBlue tank to keep topped up. So you can see that the Euro 6 engines are largely more powerful than their predecessors, which partially compensates for the slight increase in kerbweight caused by the additional emissions control hardware. All engines are fitted with a six-speed manual gearbox as standard, with a six-speed automatic optional on some models. What’s the Renault Master like to drive? Whatever engine output you choose you’ll find this is a strong, gutsy motor with plenty of low-down pulling power. And while the entry-level versions obviously aren’t going to be as happy at their maximum payload as the 170hp monsters at the top of the range, they will still get the job done. Managing the Master’s potentially vast size is easy enough, too. The steering is light, and the front wheels turn a long way, giving this large van a surprisingly nimble turning circle. It isn’t as stable in a straight line on the motorway as some more modern rivals, meaning you have to concentrate more, especially when there’s no crosswind assistance technology – which means it’s more tiring to drive than, say, the VW Crafter. But some Masters are fitted with a lane-departure warning system to keep you on track. The ride is also rather bumpy – again especially compared to an ultra-modern rival such as the Crafter or the unflappable Mercedes Sprinter – but this does settle down once you’ve got some weight in the back. And since few people are likely to drive a large van around unladen that’s probably the main thing. Forward visibility is fine – the dashboard is low and the high seating position gives you a commanding view, as you’d expect. But the small quarterlight windows at the side and the angled door mirrors seem to quickly get filthy in poor weather. Remember to clean them before you set off. 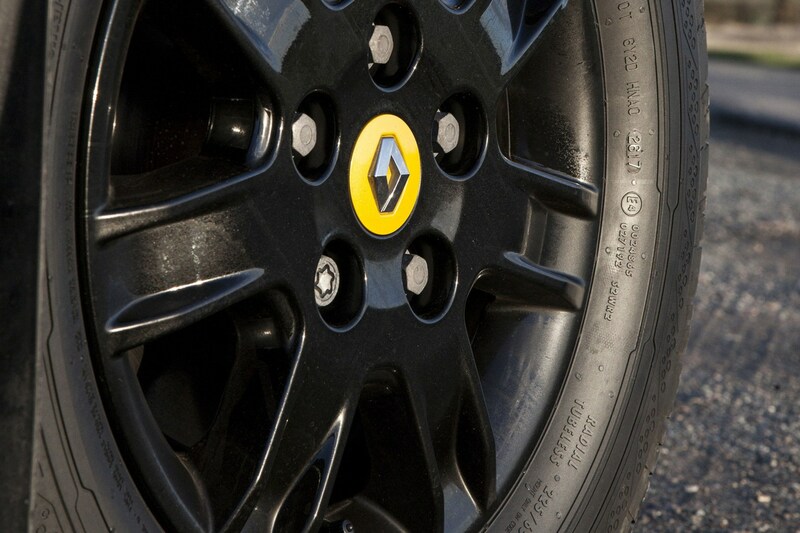 Renault Master: front-wheel drive or rear-wheel drive? Wondering which to choose? The simple guide is that front-wheel drive (FWD) Masters are lighter (good for payload) and cheaper (good for you wallet), while the rear-wheel drive (RWD) Masters offer improved traction when heavily loaded, and promise to be generally tougher, making them more suitable for towing and other hard duty. The Renault Master doesn’t have the most premium-looking interior compared to some competitors, with rather too much greyish-brown plastic for our liking. But what it lacks in luxury it makes up for with durability, and gives every impression that it should stand up to the daily rigours of being a work van. Standard equipment is generous throughout the range. For example, from 2014 onwards almost every model is fitted with satellite-navigation. Only the entry-level versions (previously called Freeway, currently called Business, in line with the rest of the Renault van range) miss out – though the basic standard system can still be upgraded to a more modern R-Link infotainment setup, as used in Renault’s passenger cars. Go for the R-Link, and instead of taking up space in the centre console, the sat-nav touchscreen gets moved to where the rear-view mirror would be in a conventional car, allowing you to keep it in your eye line without looking too far from the road. Very clever. There’s more cleverness in features such as the fold-down centre seatback, which functions as a mobile desk complete with swivelling laptop tray, and the clipboard that pops out of the top of the dash. You can also get a mobile phone holder that mounts next to the instrument cluster, near to a power socket. The sense that real thought has gone into the cabin design in order to make your working life easier continues as you explore the vast array of available storage. There’s a full-width parcel shelf above the windscreen, 7.6-litre glovebox with enough room to hold two 1.5-litre bottles, and door compartments that are also big enough to hold a 1.5-litre bottle. There are also a number of smaller compartments with card holders, coin holders, four drinks holders and stowage in the dashboard big enough to carry A4 documents. The seats are comfortable making long journeys more bearable, and the driver gets an armrest, too. A DAB radio with USB connectivity and Bluetooth is standard on all post-2014 models. For further information on the current range of Renault Master standard equipment see the Costs section of this review. The Master consistently delivers good value for money – in terms of its cargo-carrying capabilities, its standard equipment and its running costs. Fuel economy for front-wheel drive Masters is as high as 40.4mpg according to the official figures, which puts it right bang in the middle of our list of the best large vans for efficiency. A three-year, 100,000-mile warranty is standard – though for a period Renault did increase this to four years of cover, but in February 2018 this was abandoned in favour of optional an EasyLife Plan servicing scheme, which gives buyers the option of getting the first service for £99. Service intervals are every 25,000 miles or 12 months, whichever is sooner. This is starting to look a little short compared to the very latest large van rivals that can supposedly cover over 30,000 miles between dealer visits. The current Renault Master range consists of two standard equipment levels: Business and Business+. Here’s what you get for your money. A limited run Formula Edition was also introduced in late 2017, celebrating the link between Renault vans and the Renault Formula 1 team. This comes with extra kit including cruise control as standard, plus a number of bespoke styling details, including lots of black paint and yellow detailing. It’s an acquired taste, and you can read an individual review of it by clicking here. In 2017 Renault confirmed it will build an electric version of its large van, badged the Master ZE. You can read more details of this by clicking here. Despite the poor reputation of older Renault models, the French manufacturer has worked hard to improve this and there is little evidence of serious issues with this generation of Master. If buying new you do get breakdown cover that matches the length of the warranty period, for added peace of mind. At launch, Renault claimed the Master had the shortest stopping distance of any van in its class – but that was back in 2010, and the sector has moved on a bit since then. Generally speaking, the Master offers the bare minimum of standard safety equipment, with more available via the options list. On earlier examples, for instance, electronic stability control (ESC) was only standard on rear-wheel drive models – but it is now fitted right across the range as part of the basic asking price. This includes hill-start assist, trailer stabilisation and Renault’s Grip Xtend feature that works to improve traction on low grip surfaces. You do still only get a single airbag, however, with up to three more optional if you want them. Similarly, while handy features such as cruise control, automatic lights and wipers, and lane-departure warning are available, they only come at extra cost (4.5-tonne variants do get lane-departure warning as standard). Crosswind assist is not available at all. As for security, all versions of the Master are now fitted with an alarm and immobiliser as standard – though as ever you may wish to consider upgrading these features if you regularly have no choice but to leave valuable items inside the van. Which Renault Master is best for me? 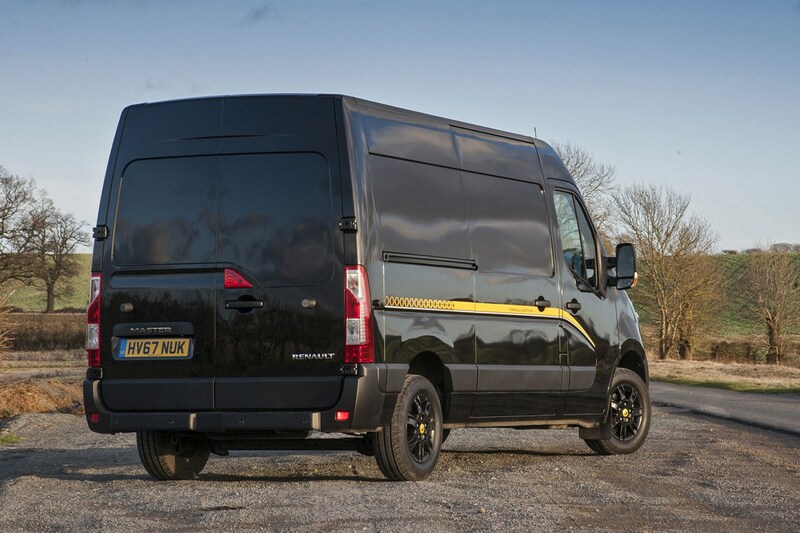 Sportier vans are becoming increasingly popular of late and, as tenuous as the link to F1 may seem with a van of this size, the Renault Master Formula Edition’s black and yellow-accented paint job confirms it as a limited edition associated with the French marque’s racing efforts. As sporty light commercial vehicles go, the Master is actually in a club of one. Despite the popularity of sporty Ford Transit Customs and Volkswagen Transporters, neither manufacturer has upped the go-faster ante on their large van ranges. 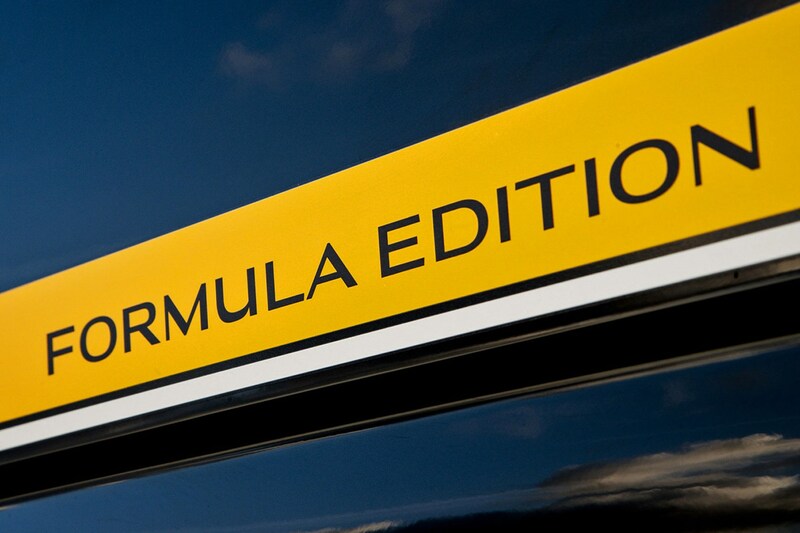 Inevitably for some F1 fans, the Formula Edition Master doesn’t look enough like a replica of the racing livery, but all that blank space gives scope for any branding the owner wants to apply to remain clearly visible. Many of the details around the exterior are well-judged, but the LED day-running lights set into the grille look a little Halfords to our eyes. Talking of which, inside it’s disappointingly ordinary with no sunny trim additions or appliques to liven-up the austere cabin – perhaps after 100,000 miles of heavy use and grime they’d turn grey like the rest of cab anyway. 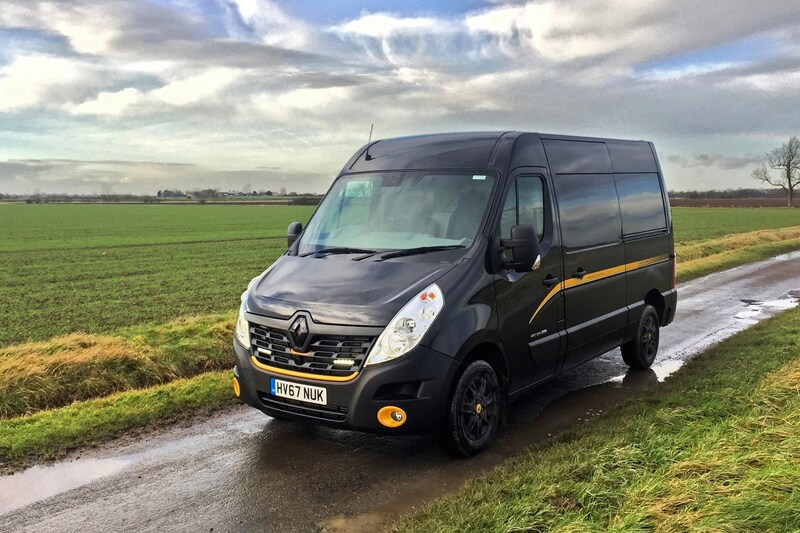 Is the Renault Master Formula Edition faster than normal? Forget notions of extra performance in the Master Formula Edition. It packs the same twin-turbo 2.3-litre diesel – dCi 170 in Renaultspeak – as others in the range. That means you’ve 170hp to deploy, with 380Nm of torque available from 1,500rpm, the latter useful on a motorway where you can keep it in sixth gear and still swiftly overtake trucks. Its top speed of 100mph is somewhat academic, but the 0-62mph time of 11.4 seconds feels swift for a van of this size. Certainly your sense of performance is increased by being sat so high up. 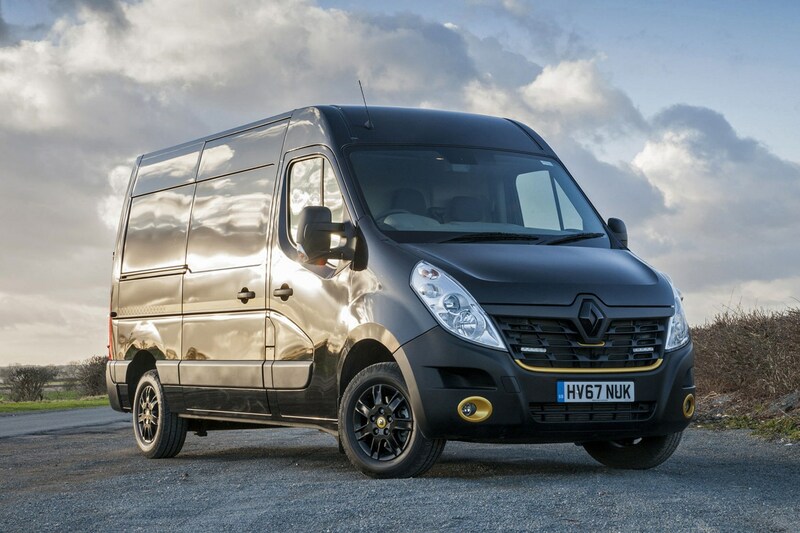 How good is the Renault Master Formula Edition to drive? If you’re hoping that the Master will share much of the smaller Trafic’s fine driving qualities, then you’re in for a disappointment. Sure, you don’t buy a capacious van to have outright enjoyment behind the wheel, but newer alternatives such as the Ford Transit and VW Crafter – it’ll be safe to add the third-generation Mercedes-Benz Sprinter to the list in due course – feel more refined, quiet and car-like. But while engine noise penetrates the Master's cab at motorway speeds, this can be forgiven to some degree thanks to its torquiness – even a heavy load in the back does little to dent its urgency. Adding weight in the rear helps settle the ride down too – it’s a bit too fidgety and unsettled when the cargo bay’s empty, lending it a tendency to feel nose-heavy and push wide if you take sweeping bends at pace. Our test of the Master coincided with a period of unseasonably foul weather – yes, snow in winter – but this posed it no problem. Particularly useful is the traction-enhancing Grip Xtend function, ensuring there’s sufficient adhesion at low speeds, even when the asphalt’s slippery. Officially, the Master will average 39.2mpg, a figure we struggled to come close to despite our best efforts. Our tally was closer to 30mpg for motorway driving and 33mpg around town, with the benefit of the stop/start system kicking in. This one had the optional 105-litre fuel tank (an extra £100), so at least you won’t have to fill up too frequently. Spending over 12 hours in total behind the wheel on one particular day of our test proved to be a comfortable, ache-free experience. There’s a decent amount of adjustment for the driver’s seat and the position of the left-sided armrest didn’t impinge on using the gearlever. A couple of option packs caught our attention in particular. For £675 the Master can be fitted with Renault’s R-Link sat-nav infotainment system, but instead of having its 7.0-inch screen nestling atop the dash, it’s on a pivoting mount up where the rear-view mirror would ordinarily be, something that makes even more sense as it doubles as a display for the £350 reversing camera. A further £500 nets you the Safety Pack, comprising of front foglights, Lane Departure Warning System and automatic main beam function. Two points of note here: the lane-departure function is very useful, particularly as road grime has a tendency to gather on the quarterlight windows on the doors, requiring frequent wipes to keep the mirrors visible. Disappointingly the automatic main beam system wasn’t as slick – it picked up oncoming cars quickly, but wasn’t sensitive enough to notice tail lights of cars being caught up before the driver in front was dazzled. In medium-wheelbase and medium height format, with the higher gross vehicle weight (GVW), MM35 guise sits in the middle of the Master line-up. 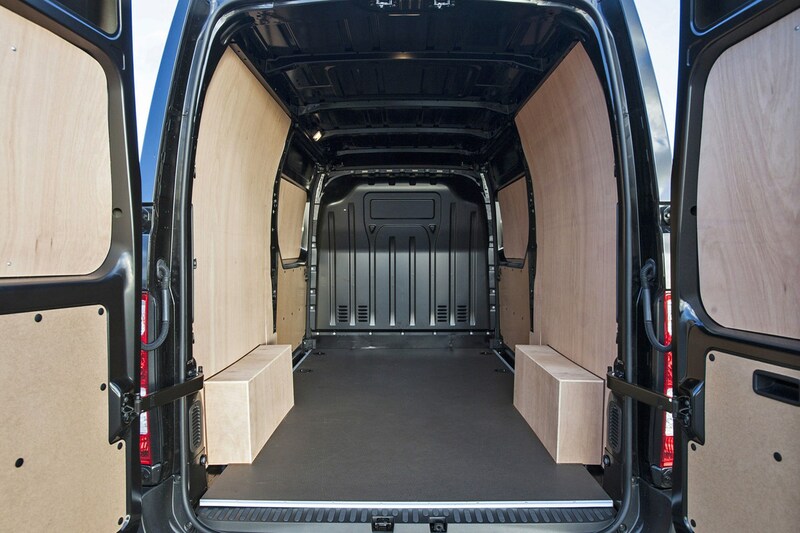 Adding further flexibility for an additional £800 outlay is the Loading Pack, including a resin-coated plywood floor to make it easier to slide loads in and out, unglazed 270-degree opening back doors and an additional sliding side door on the right-hand side of the van. Against an onslaught of newer rivals, that the Renault Master is feeling a tad old is of little debate. That doesn’t mean you should write it off, though. 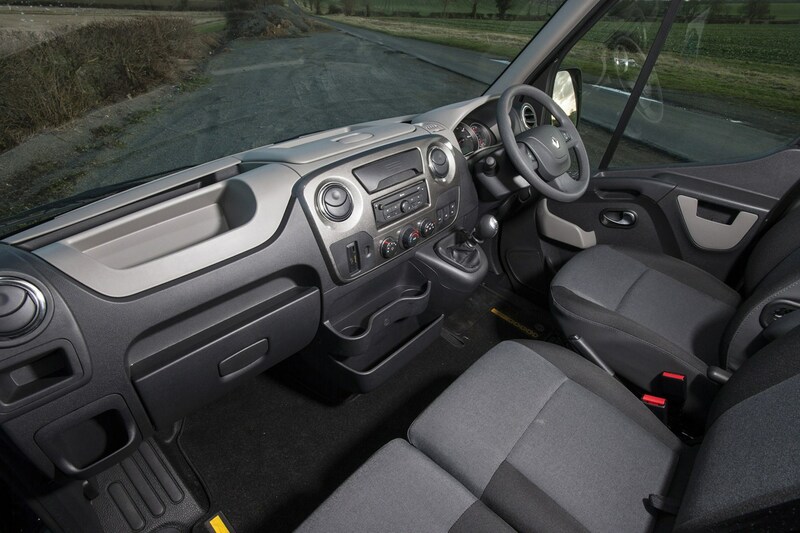 The cab’s comfy, the ride quality when laden is decent and with the dCi 170 diesel it’s punchy yet remains economical. Much of the kit the Formula Edition’s got is available on the Business+ version of the Master, a model that’s £1,000 less than the £33,150 (ex VAT) of our test example with subtler looks. But if it’s a sporty vibe in a big package you’re after, this Renault’s the place to be.